iPhone 5 screen orders down by half; is demand waning? But it's the thinnest, fastest, best iPhone ever! How can this be? Apple has reportedly cut its iPhone 5 screen orders by around half as people cease flocking to throw their money at the company. Two people 'familiar with the situation' told the WSJ that the first quarter screen orders were down because of weaker-than-expected demand, while other components were also being slashed. 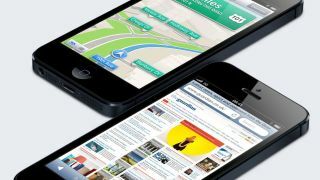 The site also reports that sources also told Japanese newspaper Nikkei that Apple has slashed its iPhone 5 component orders. Of course, the notion that the iPhone 5 is underwhelming is an obvious target; after the Apple Maps debacle, high-profile staff exits and the fairly underwhelming handset upgrades that the iPhone 5 brought with it, subsiding Apple-mania is a natural corollary. There could be another reason for the rumours though - like with the new iPad 4 launch, there's every possiblity Apple could be looking to a mid-year launch of a slightly upgraded 'iPhone 5S', which would feature an improved screen and better internals. The timing of the reports couldn't be worse for Apple, as it coincides with Samsung crowing about its Galaxy S range hitting 100 million sales, and as such a new iPhone in June would clearly steal the thunder from the Samsung Galaxy S4. Still if it is just people getting bored of Apple's stuff, there's always the iPhone 6, right guys? Right?